oh wow i love it the red and the black its the perfect colors for ichigo's bankai. almost every other wall is either monochromatic or ichigo infront of some bright background love this one. this is one good wallpaper :) the background is really cool! 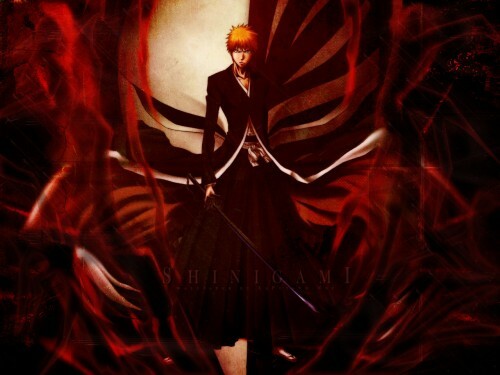 The hand guard on Ichigo's Bankai sword is the Japanese kaji for Ban which stands for "full"...... As In Full Power! that mask at the background looks awesome..nice work. nice wallpaper though he looks pissed off. Background effects and the fading in mask compliment each other nicely. Thanks so much for sharing and keep up the great work! Great work *_* I like it very much! "This spiritual pressure... it can't be!"